Compared with the remote Yalong Bay and less cleaner Sanya Bay, Dadonghai Beach often gets the glory of being Sanya’s most favorite location for visitors to enjoy beach holidays, but in its center lies a bar: WOS Beach Bar, one of the quite few places that built on the beach atmosphere allure, offering the grand sea view of Dadonghai. Located on the beautiful white sandy beach of Dadonghai and surrounded by green coconut trees all year round at its back, WOS Beach Bar is a newcomer to this area which opened for business one year ago, and has quickly gained acclaimed reputation by many local Laowais as well as tourists. Different from other bars in downtown area, the bar is more than 10 square meters larger that offers some of the area’s best oceanfront views, a steady stream of good music and three colorfully designed menus (English and Chinese, Russian) of food favorites. Go straight downstairs from the Wave Bar Restaurant, which is located in front of the Pearl River Garden Hotel at Dadonghai Area, your eyes will be caught by WOS Bar’s bright yellow advertise on the wall to your left. After entering it, you will get a feeling of being in a beach kiosk bar, paved by stones on the floor, walls and racks laced with spirits, liqueurs, beer bottles and wooden bar bench settings in the interior and exterior decor. The bar has four tables with umbrellas, offering an open view of the beach. In front of the bar, there is a long wooden deck chairs setting, with 20 equipped with 2 seating deckchairs per unit. The chefs, staff and bartenders are very attentive, always with lovely smiles on their faces and are ready to help. 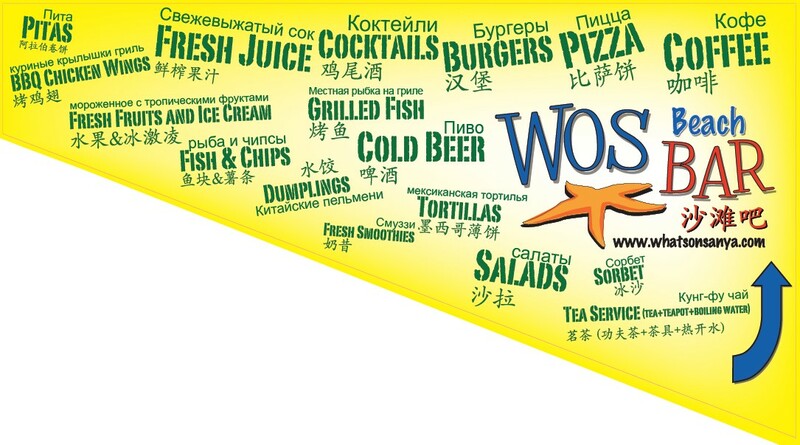 When it comes to food and drinks, WOS Bar advocates a natural and healthy lifestyle, all the juices they make for customers are made from seasonal fruits which are fresh. The bar serves up a variety of dishes throughout the day (9:00am-22:00pm). Everything is prepared mainly with carefully selected ingredients, and good to enjoy the meal accompanied by tasty wine and cold beer in Dadonghai. Whether you are a visitor looking for a laid-back beachfront atmosphere to grab a drink or a bite to eat or a local who just get a kick out of people-watching, it is this unique blend of elements that helps the WOS Beach Bar make its mark as one of the best places in Dadonghai.